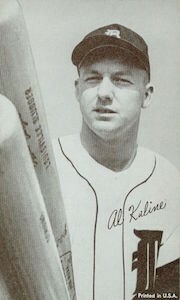 Al Kaline was one of the best five-tool players in Major League Baseball throughout his two-decade-long career. "Mr. Tiger" won several Gold Gloves, an American League batting title, and had multiple top five finishes amongst the American League leaders across most batting categories. Although his skills on the field were legendary with fans in the Motor City, collectors everywhere should take note of the top ten Al Kaline cards listed below. 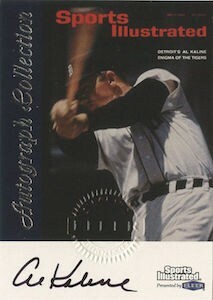 Shop for Al Kaline Cards on eBay. 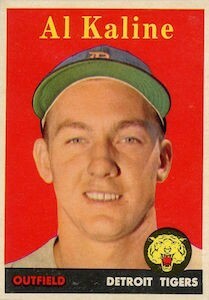 Al Kaline's rookie card was issued in the 1954 Topps set after spending the last part of the 1953 season manning the outfield for the Detroit Tigers. His career took off during the 1955 season when he won the American League batting title with a .340 mark, while finishing in the top five in the two other Triple Crown statistics. The Hall of Fame outfielder ended his career with more than 3,000 hits and helped the Tigers win their third World Series pennant in franchise history in 1968. Al Kaline has long been popular with collectors of all ages. His early cards were featured in some of the most iconic baseball card sets, such as the 1954 Topps and 1955 Bowman sets. Building on that fact, card companies have continued to include Kaline in modern products, which has helped introduce him to newer generations of collectors. This Al Kaline top ten list features the definitive cards of "Mr. Tiger" that vintage and modern collectors will want to add to their collections. 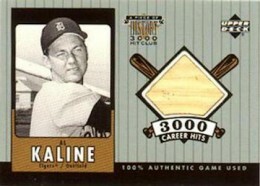 Al Kaline's first memorabilia card appeared in the 2000 Upper Deck Hitters Club product that featured players with 3,000 or more career hits. For a set featuring a lot of Hall of Fame talent, collectors can find autographs and memorabilia cards from this set fairly easily and at affordable prices. Throw in the fact that the Al Kaline memorabilia card in this set comes from the Piece of History product, which ran multiple years and featured players with either the milestone of 3,000 hits or 500 home runs, and collectors cannot go wrong by adding this card to their collections. 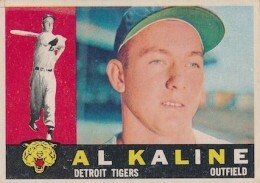 The 1974 Topps Al Kaline card was the Hall of Famer's last regular-issue Topps card. He did appear in the 1975 Topps set, but was only in the Highlights subset for reaching his 3,000th hit during the previous season. 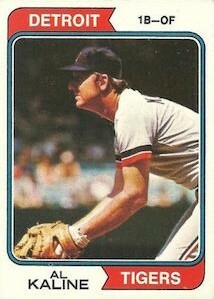 The 1974 Topps card has always been a unique card for Kaline collectors due to the fact that it is one of the few to show him playing in the field. The photograph on the card not only showcases Kaline in a defensive stance, but he is also at first base rather than his customary spot in right field. The Sports Illustrated Greats of Game Autograph for Al Kaline is easily the best of his early autographs. The iconic per-pack autograph set features a great checklist, a classic design using the Sports Illustrated covers, and a nice space at the bottom for signers to provide collectors with clear signatures. The Kaline card in this product does not disappoint, featuring a Sports Illustrated cover of Kaline's trademark swing, and his on-card autograph at the bottom. Kaline was featured on two Exhibits cards over the twenty years that the Exhibit Supply Company of Chicago issued these black-and-white, postcard-style photographs. 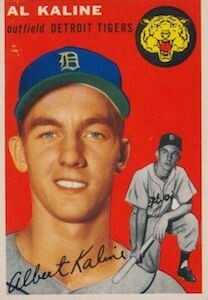 One of the variations includes him in a generic baseball uniform with his hat turned around backwards, while the other more popular Exhibits card, shown below, features Kaline wearing the classic Tigers home uniform. 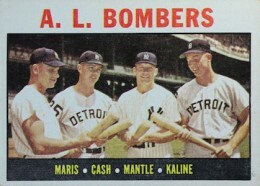 The 1964 Topps set featured some great multi-player cards including this gem picturing Kaline with teammate Norm Cash and Yankee sluggers Roger Maris and Mickey Mantle. Multiple Hall of Fame players on one card with two other stars makes this card a real winner. While many baseball fans from the 1960s feel like Al Kaline was often under appreciated, Topps did a great job of getting him on a card with a legend like Mickey Mantle. The 1955 Doubleheader set was Topps' first trial with launching a set outside of their flagship baseball brand. The cards were sold in penny packs with the customary slab of gum. However, they stand out because a perforation in the card towards the top half allowed collectors to fold their cards over to see another player featured on the back. When the cards were folded over, the player on the back of the card would share their lower legs and feet with the player on the front. The back of the cards also includes the stat lines of both players running vertically down the card. Venezuelan versions of the Topps base sets started in 1959 and continued through the 1960s. The Venezuelan Topps cards have become popular collectables with vintage card enthusiasts due to the fact that they are difficult to run across, especially in good condition. While some of the Venezuelan sets display clear differences from their Topps base set equivalent, other sets are harder to distinguish. The 1960 Topps and Topps Venezuelan sets have few differences outside of the fact that the Venezuelan cards have less gloss on the fronts and the colors appear softer or duller. The 1958 Topps set is one of the great early Topps sets. The vast majority of cards printed in this product feature the players' name in white type across the top of the card. However, Topps placed a few color variations in the set which are highly sought-after cards. Most of the variations in the set simply change the font color on the front from white to yellow, as is the case with the Al Kaline card, but a few other cards in the set alter the background color as well. 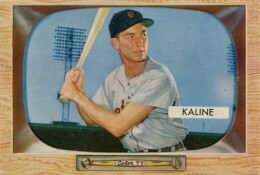 The yellow variation for Kaline commands a significant premium in terms of price, especially for high-graded copies. One of the iconic baseball sets of all-time offers a nice second-year card for Kaline. The 1955 Bowman set is full of Hall of Fame options and is one of the most popular products amongst vintage collectors. These oversized cards are hard to find in mint condition due to the fact that the edges of the cards chip easily and the centering is often less than ideal. Al Kaline is one of three Cooperstown residents to have a rookie card in 1954 Topps along with Hank Aaron and Ernie Banks. While Kaline's first year was the worst season of his career, his debut baseball card in the 1954 Topps set is easily his best. 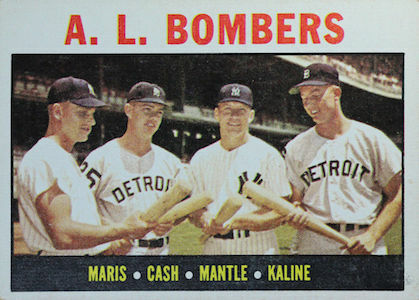 Although some of the early 50s Topps sets featured short printed rookie cards, the company did away with the concept for the 1954 set, making the Kaline rookie card a little bit easier to find.